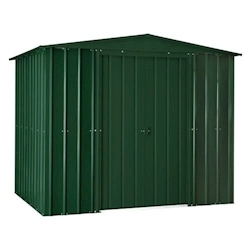 This 5x6 metal garden shed is manufactured from high quality, hot-dipped galvanised steel. Its construction ensures that it is robust as well as low-maintenance, and its design means that it will look stylish in any garden setting. The Lotus Metal Apex shed is UK-made and delivered free throughout most of mainland Great Britain.